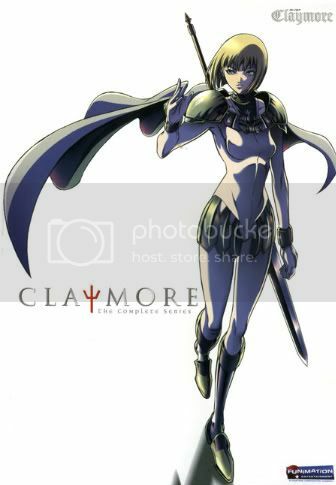 Claymore. What can I say? This anime has been one of the most enjoyable and fun series I have ever watched and has left an impression on me that very few animated works have achieved. 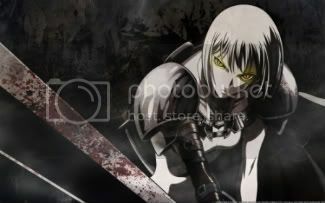 I'm going to start this review off with the story of Claymore and what you can look forward to seeing in this anime, but before reading on please keep in mind that this is just my feelings on this series and many may agree or disagree depending upon their personal taste so please don't take my word for it, go and watch it. The story kicks off with an angry monster called a "Yoma" wreaking havoc in a small village and killing many of it's residence, the town folk hired what they call a "Claymore" (Clare) to come and kill the Yoma before it kills off everyone in the village and through this event she becomes introduced to Raki, a young boy who's family was killed by the monster she is hunting. Raki begins to grow attatched to Clare and begs to come along with her on her journey as her cook, Clare agrees and the two begin to get closer and closer as the series progresses, eventually though they do end up becoming seperated only to find eachother once again toward the end of the story. Throughout Clare's adventures she finds herself at odd's with the same organization that she serves and eventually falls into a group of girls who are beginning to see the twisted reality that the Claymore organization stands for and they make a pact to keep their motoves to themselves and to stick together, the group is targeted by the higher up's and are given a series of job's to kill some of the most powerful Yoma's in the world as punishment. These ultra powerful Yoma are referred to as "Eaters" or "Awakened Beings" and are the most dangerous of all Yoma, throughout the 26 episodes of Claymore you will see many Awakened Beings and some of the battle scenes that take place with these monsters are really some of the best and most exciting fight's I have seen in an anime, it's pretty spectacular in my opinion and I'm sure you will enjoy them too. One fight in particular that was really impressivee takes place between a group of Claymore's and a giant Yoma who is controlled by a young girl who is an ultra powerful Awakened Being but has not taken on the form yet, it was really impressive and very long so keep an eye out for that one. I would say that this is one of the rare anime series out there that takes it's action and story and blends it into a perfect mix and balances it out nicely throughout it's entire run, my hat's off to the creators for that and I wish more anime could achieve this. The art in this series is a real strong point for me, I felt that the character designs were very well done and the animation was very fluid and looks good on my 47 inch television, so I have no complaints there. The music was also very well done, many of the tunes you hear in this anime either fit the scenes really good or makes the scenes all the more epic, so the composers really deserve some major credit in making a fantastic score that brings vital atmospheric moments to light over Claymore's 26 episodes. As a whole there really isn't many things about this series that aren't good, though I have heard some complaints about the blood and the way it sprays out of the injured as if a fire department unleashed their hoses on a 5 alarm fire, I have also heard people complain that the anime strays from the manga after a certain point. I think these complaints are kind of petty in some ways, blood does not always have to be realistic for crying out loud, especially in a fantasy setting, and not all anime series have to follow it's manga through and through, I believe that there is always room for changes and improvement and I like having multiple ways of looking at things. I don't think changing the story in an anime from it's original manga form is a major issue, it gives us alternative storytelling and it makes some anime worth watching, what would be the point in watching a series that is identical to it's manga which you have already read 2 or 3 times over? None. As always I want to thank those who took the time to read my blog, it's much appreciated and you can always check me out at www.twitter.com/manga4life as well as TZ and JD. 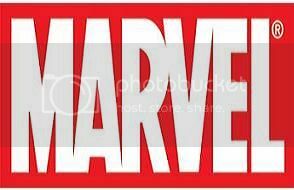 Marvel set to enter a new age of comics. This spring Marvel Comics plans to roll out a new direction within it's universe, the company believes that it's time to get back to the basics and let their heroes be heroes once again and to put an end to the "dark" times that have plagued their comics for the past 5+ years. It's about damn time in my opinion. I can't tell you how long it's been since I have picked up a comic book and felt like I was being treated to something special, I feel as if the heroes that inhabit both the Marvel Universe and the DC Universe have been really beaten down by the creative teams over the past decade and it's affected the storytelling and the way that we view the characters as fans. Remember when it used to be something special to see Spider-Man show up to save the day from a dastardly villain trying to pull off a major crime? Or how about the feeling you would get when someone would point to the sky and Superman would be flying by and you knew that whatever the horrible situation was that ol' Superman was not going to let it happen? Do you get those classic feelings of iconic heroes doing what they do best anymore? Yeah....neither do I.
Marvel claims that their heroes will be "super" once again, apparently we are going to see a rebirth of the Marvel Universe that is going to be written in a way that both long-term fans of the books will not feel alienated and new readers will be able to dive right in and not feel out of place. This is all fine and dandy, but you know it's not going to be a perfect slice, something will either spill over and new fans will wonder what is going on or they will leave something out of the overall picture that the long time fan will become enraged about, it's inevitable and it's something that always happens whenever you hit the all important "reset button" as a creative talent. Another thing that some fans may not realize is that Marvel is not just doing this with it's Avengers like originally thought, but over the course of the spring/summer it's going to affect pretty much all of the core characters, I found this out through reading solicitations for June and July where they mention that (insert title here) has arrived in the "Heroic Age". Not only is this new age of comics going to affect the core universe, but eventually it's going to make it's way to the X-Men titles and Marvel even plans to release a slew of new series that fit the "Heroic Age" such as a new monthly series called "Spider-Man & Wolverine", a teenage team book called "Young Allies" and a solo ongoing title based on Hawkeye. That's all I have to say about Marvel's new direction for now, I'm excited about it and I will be posting a blog once the titles hit the shelves next month and I may even add a video of me flipping through the pages to show off the art and some of the cool covers that we may see with the new initiative. Until then, make mine.....MANGA! The blog is up, now to introduce myself! My name is Manga4life (sometimes AnimeOtaku1) and I am a huge fan of lot's of different things, primarily Japanese anime and manga. I also enjoy playing video games, reading comic books and collecting trading cards based on my favorite animated shows, I guess I am just a big kid at heart even though I'm in my late 20's but there is nothing wrong with that (or so I've convinced myself). I decided a few months back that I was going to create a blog, I know people who have blogs and they do some pretty cool stuff with them so I figured I could be doing the same thing, it took me like 4 months to get around to doing it but here it is and I'm ready to begin laying my thoughts and opinions down for the world to see. I have been getting more and more into the internet forums/messegeboard thing, for years I stayed on one solitary board and then became a moderator there but after a while I realized that my interests were better served elsewhere so I joined a forum called Toon Zone and another one called Just Dub's and I am really enjoying my stay on both sites, they even made me a moderator on the latter. How cool is that!? I didn't realize how many people out there love to watch cartoons, I'm serious, Toon Zone is filled with tons of teens, twenty-something, and even thirty-somethings who enjoy watching cartoons whether it be anime or traditional run of the mill animation so I feel like I fit right in because everyone there....is just like me! Same thing goes for Just Dub's, there are tons of people who prefer dubbed anime to subbed anime and for the most part the members there are fantastic, I have even been adopted into someting called the "Anime Mafia" which is a group comprised of the best posters on the board, a true honor indeed. I am also looking for a forum out there that focuses on strickly manga discussion and one that focuses on trading card game discussion, so far I have yet to find a place I want to settle into, though I have been thinking of joining the ANN forums for the manga discussion. Anyway, I plan on researching a little more and I'm bound to find something eventually, maybe someone knows of a private group looking for members or something along those lines? Recently I have been bitted by the Twitter bug, I know a lot of people from the forums I have joined have accounts there so I joined and as of this writing I have 3 followers.....yes, 3 followers. I expect my followers to increase as I add "hashtag's" to my posts and I'm sure some of the people I follow will eventually follow me back, so I guess I just have to give it time. It's been a blast so far though and I can see how some people can get as addicted to it as they have, there is lot's to like afterall. My Twitter is located at www.Twitter.com/Manga4life but I also added something to my blog that shows a few of my most recent Tweets at the top of the page, so if you drop by here you can see some of whats going on in my world (if anyone even cares, lol). Thats it for now, I appreciate it to those who decided to drop by and check out my ramblings!